Instagram is the most popular photo sharing social platform in the world today, with over 800 million users. This figure also includes close to 25 million business profiles and 2 million advertisers. What makes Instagram instantly endearing to its almost-inching-towards-a-billion users is that the app provides a fun and interesting platform to display their creativity via a simple, visual medium. Instagram, through its engaging model, manages to captivate the users’ attention and interest by channeling the power of picturesque imagery. Despite being owned by Facebook, its appeal hasn’t diminished with users yet – which may be a result of it retaining its non-intrusive and fun vibe. Thus, Instagram presents an impeccable opportunity for businesses to share their brand identity in a visual, creative and engaging way. Regardless of your business being big or small, regardless of the services you might provide, rest assured that your brand will gain visibility and recognition if you play your cards right on this app. Take a look around and you’re sure to discover that brands are increasingly trying to make the most of visual content and establish connections with their prospects and customers. And what’s interesting is that they’re actually seeing results. According to a study published by HubSpot, visual content is the perfect way for businesses to engage with their audience on the highest level, especially while using social media marketing. An average of over 55 million images are shared by Instagram users on a daily basis. 7 out of 10 hashtags to appear on Instagram are those of brands. 30% of Instagram users have been known to buy a product they find on the app. Instagram scored 3.64 billion USD in global advertising revenue in 2017. The Instagram Stories are known to hit 300 million active users, which is almost 2 times that of Snapchat. Optimizing Instagram isn’t limited to B2C or C2C markets; even B2B companies across sectors can develop relevant and useful visuals for their target audience. 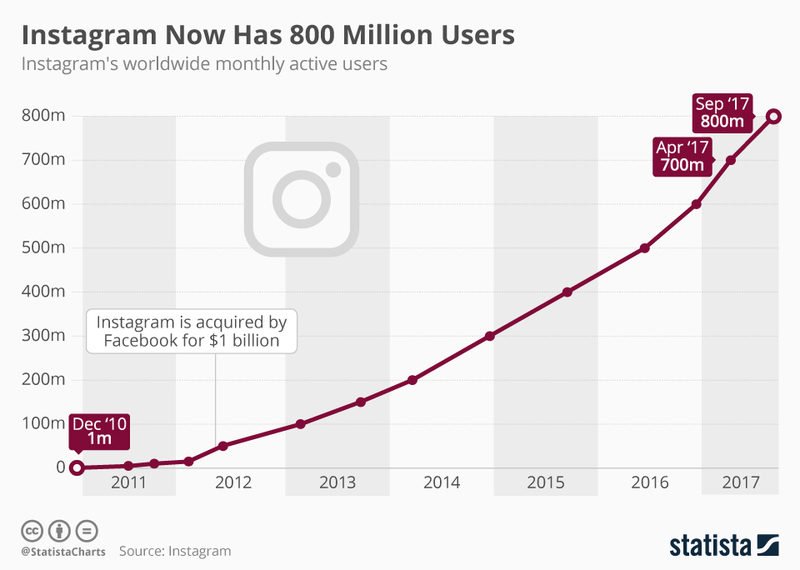 With over 800 million users, it is undisputed that there is an audience for anything and everything on Instagram. And yet, small and medium-sized business are hesitant in exploring Instagram as a veritable advertising platform. However, the fact remains that as long you manage to develop genuine and impressionable visuals, Instagram can help you maximize your marketing investment. A brand – be it a real estate company, a stockbroking firm, an educational institution, or a consumer durables manufacturer – is, after all, a faceless entity. Using Instagram helps in building a close, targeted community that you connect with regularly. As your followers begin to positively interact with your visual content it establishes an emotional connection with them. This, in turn, makes your brand more human and relatable and helps boost sales. Your business account can be used to display a more personal and intimate side of your company which can be of interest to your followers, provided it’s done right, of course. You can try sharing business landmarks and achievements, memories, celebrations, and even social responsibility initiatives. When done in a warm and easy-going manner, this can lend an aura of authenticity to your business. Social media is alive and buzzing 24/7. This means that you have a wide array of testing resources at your fingertips. Want to try out a new idea for a product? Want to launch a new service? Why not include your followers to tell you what they think about it? This way, your followers are bound to feel a part of your business decisions and are encouraged to give you their true feedback. User-generated content is exclusively created by like-minded consumers or fans and followers about a product or a brand. User-generated content is not paid for by the company, which renders it authentic to other viewers. Thus, your actual user can be an indirect advertiser for your brand or product. User-generated content is frequently reposted by brands who look forward to leveraging it to the maximum. Major brands including Netflix, Mumbai Indians, Starbucks, etc. often regram and repost user-generated content from their followers’ accounts. With over 800 million active users, you already have a wide base of audience across demographics waiting to interact and build relationships with the brands of their choice. According to Pew Research, almost 35% of Instagram users were active all through the day, having logging in multiple times. More than 50% of them checked their news feed at least once in 24 hours. Thus, Instagram is the platform that will help you seize the chance to create authentic brand awareness. Let us clear this up – Instagram is not a direct traffic generation tool. On the contrary, it is more about generating long-term visibility and creating social presence. With Instagram, your aim should be to establish a true and real relationship with your target audience in a classy and intelligent manner. Therefore, spamming and irrelevant advertisement inserts are a strict no-no. Instead, use a short URL to your website in your bio and draft an interesting description to let your audience know what your business is all about. So, are you ready to explore Instagram and enjoy the various business benefits that come with it? In case you’re still hesitant, our social media experts here at GladOwl can handle your social media accounts. With varied costing plans and offers, we as an agency can guide you in building a strong online presence for your business.